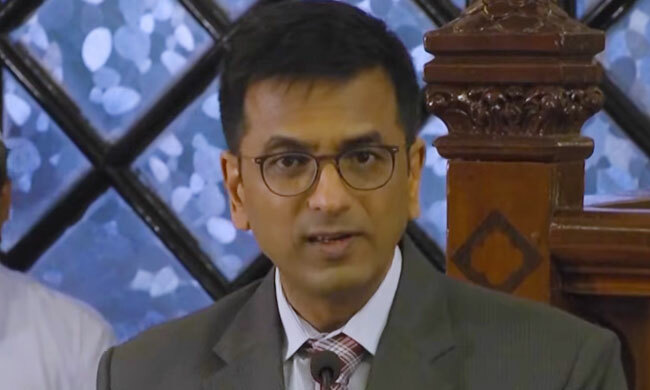 Commenting on the great chasm between the idealistic vision of Constitution and actual working of it at ground level, Justice D Y Chandrachud said "when a person is lynched for the food he or she had, it is the constitution which gets lynched". "The Constitution fails when a cartoonist is jailed for sedition. When jail instead of bail is granted to a blogger who was critical of religious architecture, the constitution fails"
"When we deny the power of love to people on grounds of religion and caste, the Constitution weeps. Exactly this happened yesterday, when a dalit groom was forced to step down from the top of a horse. When we read of such incidents, the constitution weeps", he added with pathos. Justice Chandrachud was speaking at Justice Desai Memorial Lecture at the Bombay High Court organized by the Bombay Bar Association. He started his lecture reminiscing Balgangadhar Tilak, who was tried in the same court very same room years ago. He said that Constitution was a not a mere document of transfer of power from the British crown to Indian Republic. Article 395 of the Constitution, which repudiated the Indian Independence Act 1947, signifies this by breaking the chain of autonomy of the Constitution to the British Crown. Thus, the framers ensured that the Constitution was an autochtonous document, with its roots in the Indian ethos. Constitution has a transformative vision, which seeks to give people the power of destiny. Individual is its basic unit. A constitutional culture is based on belief that it unifies people beyond one's immediate sphere of acquaintance. "We" in the preamble is an inclusive and ever expansive "we". He commented about the emancipatory nature of Constitution, which was reflected in the Sabarimala temple case. The right of a religious denomnation is not a stand-alone right, which can exist in isolation from a woman's right to dignity flowing from Articles 14 and 15. The world is witnessing new age changes, which is rapidly altering the definitions of personal and cultural identities. He referred to the new breed of state nationalism, new forms of secular and religious violences, new politics of sexual and cultural identities etc, which are changing the nature of interactions between an individual and society. The very definition of personhood is undergoing change in view of technological developments like Artificial Intelligence. The framers of constitution may not have foreseen these changes. The silences in the constitution should be punctuated with its transformative and emancipatory ideals to make Constitution a living document, which can effectively deal with the new-age challenges. "Constitution works, even if it doesn't matter to you. Constitution affects you, even if you don't believe in it", he said, concluding the lecture. "In the initial days of the birth of the nation, a stronger government tried to drive a socio-political revolution. Immediately, two decisions fuelled the change- the Romesh Thapar case striking down the Madras Maintenance of Public Order Act, and Brij Bhushan v. State of delhi by virtue of which the East Punjab Public Safety Act was struck down"
"This was followed by the introduction of the Reasonable restrictions in 19(2) on the grounds of public order, friendly relations with foreign states and incitement to an offence...by the first amendment, Articles 31A and 31B were added which saved the laws providing for acquisition of estates for being inconsistent with the Fundamental Rights...this was the Centre's struggle to centralise power through the Constitution"
"In A. K. Gopalan, the validity of a preventive detention law was to be determined within the four corners of Article 22, with no regard for 19 and 21, 22 being deemed to be a complete code in itself...Fundamental Rights were not seen as a continuous entitlement but as isolated instances of discrete rights. The Supreme Court's stand then was of deference to the State agenda"
"With the recognition of the Basic Structure doctrine in Kesavanada Bharti, limiting the plenary power of the government to amend the Constitution at its whims, the Constitution has endured", remarked Justice Chandrachud. "The resilience of the Constitution is not just in placing individuals at the forefront of its endeavours but in the creating the vibrant institutions which sustain the democratic structure...democracies thrive when these institutions thrive, and nations fail when the institutions fail! ", he articulated. "Our Constitution has been called the most boisterous and contentious enterprise, bestowing the largest and the most diverse democracy with legal forms", he continued. "During the framing of the Constitution, a significant question arose as to whether religious and other groups should have distinct representation in the electoral process. The Government of India Act envisaged communal representation in electorates, which idea was rejected by the minorities sub-committee and the advisory committee. The concept was finally done away with by Article 325. The charter of Fundamental Rights begins with non-discrimination on account of religion, race or caste...the Assembly granted autonomy to religious minorities...secularism was finally assigned the value of a basic feature of the Constitution by the Supreme Court in S. R. Bommai"
The judge highlighted the asymmetric federalism- how right through the 1970s, one is impressed by the accumulation of power at the Centre, while post 1990, the growth of regional parties and the acknowledgment of the aspirations of the states by the Supreme Court brought about a degree of decentralisation. Speaking of constitutional identity, he remarked that homogeneity is the anathema to the Constitution. Constitutional identity is borne not merely from the features and ideals enumerated in its text, but from the relation between the constitution and the culture in which it operates, the gender, religious and national identities.